The Six-Day War: Table of Contents|Battle Maps|"Myths & Facts"
Why Didn’t the War Lead to Peace? In 1963, the Arab League decided to introduce a new weapon in its war against Israel — the Palestine Liberation Organization (PLO). The PLO formally came into being during a 1964 meeting of the first Palestinian Congress. Shortly thereafter, the group began to splinter into various factions. Ultimately, the largest faction, Fatah, would come to dominate the organization, and its leader, Yasser Arafat, would become the PLO chairman and most visible symbol. All the groups adhered to a set of principles laid out in the Palestine National Charter, which called for Israel's destruction. Most of the attacks involved Palestinian guerillas infiltrating Israel from Jordan, the Gaza Strip, and Lebanon. The orders and logistical support for the attacks were coming, however, from Cairo and Damascus. Egyptian President Nasser’s main objective was to harass the Israelis, but a secondary one was to undermine King Hussein’s regime in Jordan. King Hussein viewed the PLO as both a direct and indirect threat to his power. Hussein feared that the PLO might try to depose him with Nasser’s help or that the PLO’s attacks on Israel would provoke retaliatory strikes by Israeli forces that could weaken his authority. By the beginning of 1967, Hussein had closed the PLO’s offices in Jerusalem, arrested many of the group’s members, and withdrew recognition of the organization. Nasser and his friends in the region unleashed a torrent of criticism on Hussein for betraying the Arab cause. Hussein would soon have the chance to redeem himself. In September 1965, Arab leaders and their military and intelligence chiefs met secretly at the Casablanca Hotel in Morocco to discuss whether they were ready to go to war against Israel and, if so, whether they should create a joint Arab command. The host of the meeting, King Hassan II, did not trust his Arab League guests and, initially, planned to allow a joint Shin Bet-Mossad unit known as “The Birds” to spy on the conference. A day before the conference was scheduled to begin, however, the king told them to leave out of fear they would be noticed by the Arab guests. Hassan secretly recorded the meeting and gave it to the Israelis, who learned the Arabs were gearing up for war, but were divided and unprepared. The breakup of the U.A.R. and the resulting political instability only made Syria more hostile toward Israel. Another major cause of conflict was Syria’s resistance to Israel’s creation of a National Water Carrier to take water from the Jordan River to supply the country. The Syrian army used the Golan Heights, which tower 3,000 feet above the Galilee, to shell Israeli farms and villages. Syria’s attacks grew more frequent in 1965 and 1966, forcing children living on kibbutzim in the Huleh Valley to sleep in bomb shelters. Israel repeatedly protested the Syrian bombardments to the UN Mixed Armistice Commission, which was charged with policing the cease-fire, but the UN did nothing to stop Syria’s aggression — even a mild Security Council resolution expressing “regret” for such incidents was vetoed by the Soviet Union. Meanwhile, Israel was condemned by the United Nations when it retaliated. Syria’s attacks on Israeli kibbutzim from the Golan Heights finally provoked a retaliatory strike on April 7, 1967. During the attack, Israeli planes shot down six Syrian fighter planes — MiGs supplied by the Soviet Union. Shortly thereafter, the Soviets — who had been providing military and economic assistance to both Syria and Egypt — gave Damascus false information alleging a massive Israeli military buildup in preparation for an attack. Despite Israeli denials, Syria decided to invoke its defense treaty with Egypt and asked Nasser to come to its aid. In early May, the Soviet Union gave Egypt false information that Israel had massed troops along the northern border in preparation for an attack on Syria. In response, Egyptian troops began moving into the Sinai and massing near the Israeli border on May 15, Israel's Independence Day. By May 18, Syrian troops were prepared for battle along the Golan Heights. On May 22, Egypt closed the Straits of Tiran to all Israeli shipping and all ships bound for Eilat. This blockade cut off Israel's only supply route with Asia and stopped the flow of oil from its main supplier, Iran. President Abdur Rahman Aref of Iraq joined in the war of words: "The existence of Israel is an error which must be rectified. This is our opportunity to wipe out the ignominy which has been with us since 1948. Our goal is clear -- to wipe Israel off the map." (14) On June 4, Iraq joined the military alliance with Egypt, Jordan and Syria. One man who opposed going to war was David Ben-Gurion. After the bitter experience of the Suez War, when he ordered the attack on Egypt without the support of the United States, and President Eisenhower subsequently forced Israel to withdraw from the territory it won in the war, Ben-Gurion believed Israel needed the support of a Western power. He also feared Israel weapons supplies would be jeopardized and Israeli casualties would be enormous. Some Israelis were calling for Ben-Gurion to replace Eshkol, but his anti-war views caused him to lose political support. Instead, pro-war factions of the government who thought Eshkol was too weak to lead the country successfully pressured him to appoint Moshe Dayan as defense minister. Israel decided to preempt the expected Arab attack. To do this successfully, Israel needed the element of surprise. Had it waited for an Arab invasion, Israel would have been at a potentially catastrophic disadvantage. On June 5, Prime Minister Eshkol gave the order to attack Egypt. Moreover, while the Arabs were falsely accusing the United States of airlifting supplies to Israel, Johnson imposed an arms embargo on the region (France, Israel's other main arms supplier, also embargoed arms after Israel ignored De Gaulle’s plea not go to war). Meanwhile, the Arab oil-producing countries meeting in Bagdad unanimously decided to stop the flow of oil to any country taking part in an attack on any Arab States. To demonstrate the national consensus behind the decision to go to war, Prime Minister Levi Eshkol decided on the night the war began to invite opposition leader Menachem Begin to join the government. In the context of Israeli politics, this was an extraordinary move because Begin was not only the opposition leader but someone long seen as dangerous by his rivals. Labor Party leader David Ben-Gurion, just 19 years earlier, had been so afraid of the possibility that Begin’s Irgun was a threat to the newly established state of Israel that he ordered his forces to shell the Altalena arms ship. Prime Minister Levi Eshkol sent a message to King Hussein on June 5 saying Israel would not attack Jordan unless he initiated hostilities. When Jordanian radar picked up a cluster of planes flying from Egypt to Israel, and the Egyptians convinced Hussein the planes were theirs, he ordered the takeover of the UN headquarters located near Talpiot and the shelling of West Jerusalem. Snipers were shooting at the King David Hotel and Jordanian mortars had hit the Knesset. It turned out that the planes were Israel’s and were returning from destroying the Egyptian air force on the ground. 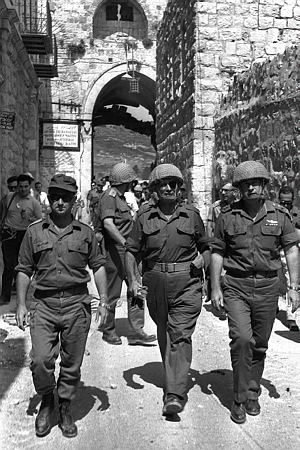 Paratrooper Brigade 55, commanded by Colonel Motta Gur, was sent to Jerusalem and given the impossible task of preparing an assault on the city in just 12 hours. Jordan had two battalions of experienced, well-trained fighters assaulting the city. The initial mission was to stop Jordanian shelling of Jewish neighborhoods and rescue a besieged Israeli unit stationed on Mount Scopus, the sole Israeli enclave in East Jerusalem. The soldiers were ordered to stay away from the Old City and its sacred sites. When the paratroopers arrived, fires were raging and the streets were full of glass. They could smell exploding shells. When they got off their bus, people suddenly began to appear from all directions carrying food. People came from all over, Avital Geva recalled in the documentary In Our Hands. They didn’t care about the bombings. Women brought food, sweets, coffee, everything. You cannot describe it. It was spontaneous love. At 2 a.m. on June 6, one of Brigade 55’s three battalions attacked the Jordanian position known as Ammunition Hill, and fought one of the bloodiest battles of the war. The paratroopers blasted their way through the mine fields and cut through layers of razor wire fences, but the price was high. In just the initial thrust, seven soldiers were killed and more than a dozen injured. The Israelis had not trained for trench warfare and had to improvise. Two soldiers jumped on tanks and ordered them up the hill firing at every Jordanian soldier they spotted. Years later, a Jordanian soldier admitted the tanks had convinced them the battle was lost and they retreated from the hill. It had taken three hours to capture the Jordanian command bunker. Of the 260 soldiers who fought at Ammunition Hill, only eleven emerged without being wounded or killed — 36 died. The Jordanians lost 71 men. After the battle, the Israelis buried 17 Jordanian soldiers in a mass grave with the English epitaph, Here lay 17 brave Jordanian soldiers, IDF, 1967. A second battalion, the 66th, was assigned to take up a position at the Rockefeller Museum opposite the Arab quarter of the Old City to prepare to enter through the city if given the order. The soliders were unfamiliar with the city, however, and took a wrong turn that led down a narrow alley where they faced withering fire from the Jordanian forces. The Israelis made their way through to the museum, but only 30 paratroopers, half their original force emerged unharmed from what they later called the Alley of Death. Meanwhile, a third group of paratroopers from the 71st battalion succeeded in achieving its objective of securing a position on Mount Scopus. While forbidding the army from entering the Old City, Eshkol said, “if the connection to Mount Scopus is completed this morning, the West Bank should be conquered up to the peak mountain ridges, while enabling escape routes for civilians.” Palestinians took advantage of those routes to flee eastward. Nasser and Hussein still hoped to save face and their remaining troops. During a phone conversation they decided to tell the world they were losing because the British and Americans were helping the Israelis. The Israelis had recorded the call, however, and shared it with the world, which confirmed the denials of Western officials. President Johnson referred to the episode as The Big Lie. The Israelis offererd Hussein a way out of the dilemma. Eshkol said Israeli troops were perpared to take the Old City but would not do it if the king agreed to an immediate unconditional ceasefire, expelled the Egyptians generals from Jordan and began a peace process with Israel. Hussein’s response was to send troops back to Jerusalem in hopes of holding as much territory as possible before a ceasefire was declared. Dayan realized he had to make a decision. At 6:15 a.m. on June 7, Dayan ordered the encirclement of the Old City and instructed the army to enter with the warning not to damage any of the holy places. Fortunately, the night before most of the Jordanian troops had retreated so when the paratroopers stormed the gate onto the Via Dolorosa, they met no resistance. Gur led the charge up to the Temple Mount and radioed headquarters at 10:08 a.m., “The Temple Mount is in our hands and our forces are by the [Western] Wall.” The brigade’s chief communications officer, Ezra Orni, hung an Israeli flag over the Dome of the Rock. Dayan was observing from Mount Scopus and angrily radioed Gur, Do you want to set the Middle East on fire? The flag was removed. Shortly afterward, Dayan arrived with Rabin to formally mark the Jews’ return to their historic capital and their holiest site. At the Western Wall, the IDF’s chaplain, Rabbi Shlomo Goren, blew a shofar to celebrate the event, which was broadcast live on Voice of Israel Radio. The joy of reuniting Jerusalem was tempered by the loss of so many soldiers. A total of 430 paratroopers were wounded and 97 were killed. Israeli forces ordered a handful of Palestinians to move for "strategic and security reasons." In some cases, they were allowed to return in a few days, in others; Israel offered to help them resettle elsewhere. (22) The net result was that a new refugee population had been created and the old refugee problem was made worse. While most IDF units were fighting the Egyptians and Jordanians, a small, heroic group of soldiers were left to defend the northern border against the Syrians. It was not until the Jordanians and Egyptians were subdued that reinforcements could be sent to the Golan Heights, where Syrian gunners commanding the strategic high ground made it exceedingly difficult and costly for Israeli forces to penetrate. Finally, on June 9, after two days of heavy air bombardment, Israeli forces succeeded in breaking through the Syrian lines. After just six days of fighting, Israeli forces were in a position to march on Cairo, Damascus, and Amman. By this time, the principal objectives of capturing the Sinai and the Golan Heights had been accomplished, and Israeli political leaders had no desire to fight in the Arab capitals. Furthermore, the Soviet Union had become increasingly alarmed by the Israeli advances and was threatening to intervene. At this point, U.S. Secretary of State Dean Rusk advised the Israelis “in the strongest possible terms” to accept a cease-fire. On June 10, Israel did just that. The victory came at a very high cost. In storming the Golan Heights, Israel suffered 115 dead-roughly the number of Americans killed during Operation Desert Storm. Altogether, Israel lost twice as many men — 777 dead and 2,586 wounded-in proportion to her total population as the U.S. lost in eight years of fighting in Vietnam. 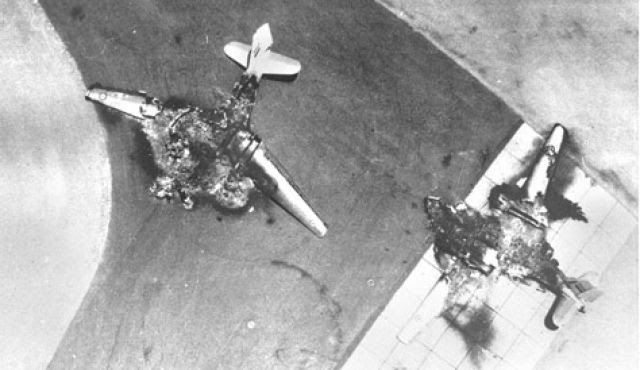 (23) Also, despite the incredible success of the air campaign, the Israeli Air Force lost 46 of its 200 fighters. (24) The death toll on the Arab side was 15,000 Egyptians, 2,500 Syrians, and 800 Jordanians. By the end of the war, Israel had conquered enough territory to more than triple the size of the area it controlled, from 8,000 to 26,000 square miles. The victory enabled Israel to unify Jerusalem. Israeli forces had also captured the Sinai, Golan Heights, Gaza Strip and West Bank. A previously little known story was publicized just before the 50th anniversary of the war disclosing that Israel had considered using a nuclear weapon to scare the Egyptians. According to retired brigadier general Itzhak Yaakov, Israel had a contingency plan code-named Shimshon, or Samson. [Israel's use of nuclear weapons as a last resort if it faced annhilation is sometimes referred to as the Samson Option.] Yaakov said Israel rushed to assemble an atom bomb with the intention of detonating it on a mountaintop in the Sinai desert about 12 miles from an Egyptian military complex at Abu Ageila as a warning to Egypt and the other Arab states if Israel feared it would lose the war. As the New York Times reported, The plan, if activated by order of the prime minister and military chief of staff, was to send a small paratrooper force to divert the Egyptian Army in the desert area so that a team could lay preparations for the atomic blast. Two large helicopters were to land, deliver the nuclear device and then create a command post in a mountain creek or canyon. If the order came to detonate, the blinding flash and mushroom cloud would have been seen throughout the Sinai and Negev Deserts, and perhaps as far away as Cairo. In November 1967, the United Nations Security Council adopted Resolution 242, which established a formula for Arab-Israeli peace whereby Israel would withdraw from territories occupied in the war in exchange for peace with its neighbors. This resolution has served as the basis for peace negotiations from that time on. Except for the requirement that school texts in the territories be purged of anti-Israel and anti-Semitic language, the authorities tried not to interfere with the inhabitants. They did provide economic assistance; for example, Palestinians in the Gaza Strip were moved from camps to new homes. This stimulated protests from Egypt, which had done nothing for the refugees when it controlled the area. Arabs were given freedom of movement. They were allowed to travel to and from Jordan. In 1972, elections were held in the West Bank. Women and non-landowners, unable to participate under Jordanian rule, were now permitted to vote. East Jerusalem Arabs were given the option of retaining Jordanian citizenship or acquiring Israeli citizenship. They were recognized as residents of united Jerusalem and given the right to vote and run for the city council. Also, Islamic holy places were put in the care of a Muslim Council. Despite the Temple Mount's significance in Jewish history, Jews were barred from conducting prayers there. The Arabs, however, had been humiliated and would have to regain their honor before contemplating any accommodation with Israel. Instead of peace, the Arab League Summit in Khartoum in August 1967 declared the Arab position toward Israel would be no peace, no negotiations, and no recognition. On November 22, 1967, the UN Security Council unanimously adopted Resolution 242, calling on Israel to withdraw from territory – not all the territories – captured in the war in exchange for “secure and recognized boundaries” with the aim of achieving a “peaceful and accepted settlement.” This resolution became the basis for future peace talks. Almost immediately after the end of the war, any hope for peace was shattered when Egypt began shelling Israeli positions near the Suez Canal. Nasser believed Israel could not withstand a lengthy war of attrition. Before a cease-fire was declared three years later, 1,424 Israeli soldiers and more than one hundred civilians were killed; Egypt suffered approximately five thousand dead. Content supplied by CBN ©2016 The Christian Broadcasting Network, Inc., All Rights Reserved. (1)Encyclopedia Americana Annual 1961, (NY: Americana Corporation, 1961), p. 387. (2)Yehoshafat Harkabi, Arab Attitudes To Israel, (Jerusalem: Keter Publishing House, 1972), p. 27. (3)Howard Sachar, A History of Israel: From the Rise of Zionism to Our Time, (NY: Alfred A. Knopf, 1979), p. 616. (3a)Sue Surkes, “Morocco tipped off Israeli intelligence, ‘helped Israel win Six Day War,’” Times of Israel, (October 16, 2016). (4)Samuel Katz, Battleground-Fact and Fantasy in Palestine, (NY: Bantam Books, 1985), pp. 10-11, 185. (5)Netanel Lorch, One Long War, (Jerusalem: Keter, 1976), p. 110. (6) Isi Leibler, The Case For Israel, (Australia: The Globe Press, 1972), p. 60. (8)United Nations Conference on the Law of the Sea, (Geneva: UN Publications 1958), pp. 132-134. (15)Chaim Herzog, The Arab-Israeli Wars, (NY: Random House, 1982), p. 149. (15a)Gili Cohen, Six-Day War documents show Dayan proposed Arab rule in parts of West Bank, Haaretz,(June 4, 2015). (15b)Michael Bar-Zohar, The War Nobody Wanted, inFocus, (Spring 2017), p. 12. (16)Lyndon B. Johnson, The Vantage Point: Perspectives of the Presidency 1963-1969, (NY: Holt, Rinehart and Winston, 1971), p. 293. (18.1)Gili Cohen, “Minutes of Last General Staff Meeting Before 1967 War: ‘Egypt Worried Israel Close to Nuclear Bomb,’” Haaretz, (June 24, 2017). (18a)Sue Surkes, “Morocco tipped off Israeli intelligence, ‘helped Israel win Six Day War,’” Times of Israel, (October 16, 2016). (18b)Meron Medzini, 1967 | The international media and the Six-Day War, Fathom, (2017). (18c)Abba Eban, An Autobiography, (NY: Random House, 1977), pp. 400-401. (18e)Michael Bar-Zohar, The War Nobody Wanted, inFocus, (Spring 2017), p. 12. (18f) The six-day war: Israel claims land and air successes as Britain and US declare neutrality, The Guardian, (June 6, 1947). (18g)Meron Medzini, 1967 | The international media and the Six-Day War, Fathom, (2017). (18h)Jerusalem Report, (June 12, 2017). (18i)Major General Rephael Vardi, The Beginning of Israeli Rule in Judea and Samaria, Jerusalem Center for Public Affairs, (April 16, 1989). (19)Encyclopedia American Annual 1968, p. 366. (20)George Gruen, "The Refugees of Arab-Israeli Conflict," (NY: American Jewish Committee, March 1969), p. 5. (21a)Gili Cohen, “Minutes of Last General Staff Meeting Before 1967 War: ‘Egypt Worried Israel Close to Nuclear Bomb,’” Haaretz, (June 24, 2017). (24a)William J. Broad and David E. Sanger, “‘Last Secret’ of 1967 War: Israel’s Doomsday Plan for Nuclear Display,” New York Times, (June 3, 2017). (25)Encyclopedia American Annual 1968, p. 366. (26)Meron Medzini, 1967 | The international media and the Six-Day War, Fathom, (2017). (27)Major General Rephael Vardi, The Beginning of Israeli Rule in Judea and Samaria, Jerusalem Center for Public Affairs, (April 16, 1989). (28)Don Peretz, "Israel's New Dilemma," Middle East Journal, (Winter 1968), pp. 45-46. (29)Aaron David Miller, “The Myths About 1967 That Just Won't Die,” The Atlantic, (June 2, 2017).